Inateck is a German company specializing in high performance products for low costs. They recently got in touch with us, and told us about their massive range of USB 3.0 devices, such as USB Hubs, PCI cards, as well as HDD readers. We had a look at the Inatek USB 3.0 HUB – Super Speed 4 Port. First of all, the easiest way to distinguish between USB 2.0 and USB 3.0 ports is the colour. USB 3.0 always comes in the shade of blue as shown in the picture. The other end of a Micro-USB 3.0 cable is also different, though it is becoming more and more common. In fact, one of the lesser known facts about the Galaxy Note 3 is that it features a USB 3.0 microUSB port at the bottom, allowing you to connect both USB 2.0 and USB 3.0 cables to it. Before I digress, let us take a look at this hub. Now most USB hubs don’t give you the chance to say much. However, the added USB 3.0 feature of this hub makes this quite interesting. Most computers and laptops these days only feature 1 USB 3.0 port. This port lets you expand that to up to 4! Installation is as simple as these things go. Plug it in, and let your computer take care of the rest. Once plugged in, you can connect your USB 3 devices to this, to enjoy the higher speed available. mple as any other port. You just plug it in, and off you go! Now theoretically, USB 3.0 should give you up to 5GbPS transfer rates. However, Inateck’s website will happily tell you to expect a real value of about 120-150MB/s. Compare this to the usual 20MB/s you get with USB2.0, and we’re on to a winner. Among other things, the hub also lights up to show you which ports are connected. The best bit though, is the fact that it comes with a power supply. This means that if you connect something like a hard drive, which wants high current output, you can supply it direct from the hub, instead of loading your computer’s ports. Also, this means you can use this to charge your phones, even when your computer is off. Once again, the beauty of USB 3 is that it allows up to 1A out, instead of the 500mA USB 2.0 gives, letting your phones charge at regular speed. It is compatible with Windows, Linux and Mac OS. Inateck have kindly given us one of these to give away to our readers! The competition runs till the 30th of September. UK entrants above 18 only, and other general Ts&Cs apply. Competition is now closed, and we’re in touch with the winner. Looks very functional to me. 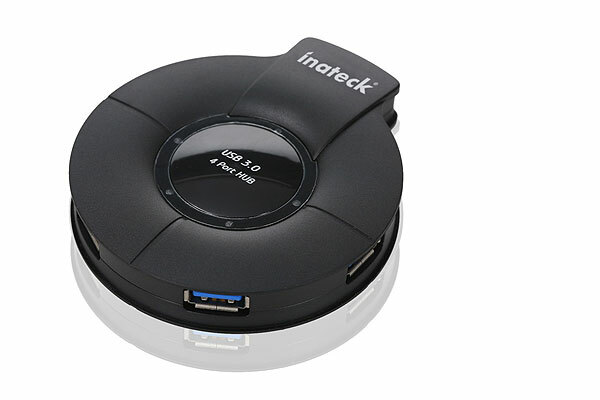 Inateck USB 3 Hub really a great usb hub…because of its speed. Thanks for sharing important information about this usb hub..